Here's how SwiftKey 3 Beta inserts spaces for you in typed emails and updates. SwiftKey just re-invented the way that you type on your Android phone or tablet with SwiftKey 3 Beta. 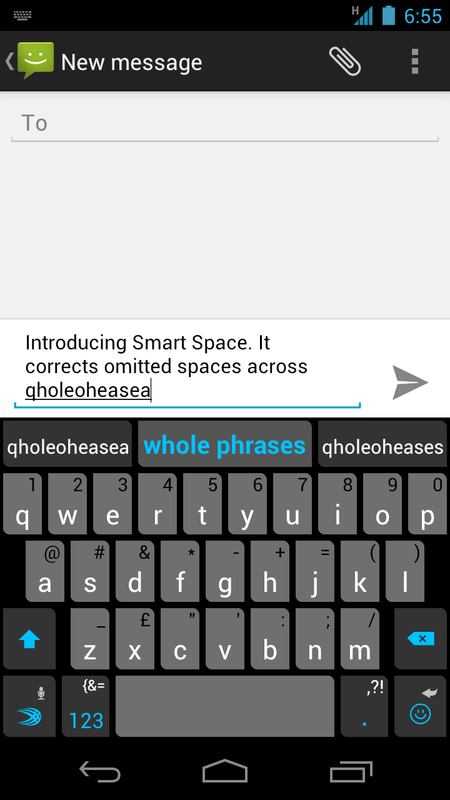 This latest version of SwiftKey's Android keyboard has a new feature called "Smart Space" that allows you to just type continuously without having to remember to insert spaces between words. Smart Space works like traditional autocorrect software except that, instead of just correcting misspelled words, the software can also detect where you've missed a space in your sentence. If you're anything like me and are always hitting the "b" or "v" keys while trying to hit the spacebar, Smart Spaces will definitely feel like a breath of fresh air. In an effort to make typing faster and easier, SwiftKey has also added Smart Punctuation. Now, instead of fishing around for a comma, question mark, or exclamation point, simple touch the "." key and a grid of the other punctuation options will pop for you to choose from and quickly insert into your messages. Here's a SwiftKey video that shows how the punctuation feature and the auto spacing addition work. You're still on your own when it comes to making sure your sentence is grammatically sound, but now you should have no excuse for including proper punctuation in your tweets or text messages. These new features are accompanied by two new themes that make SwiftKey look at home in the Ice Cream Sandwich version of the Android operating system. Keys are slightly larger than they were in previous versions of SwiftKey, making them easier to hit while you're furiously typing an email or updating your Facebook status. And, if you aren't a fan of the new look, you can always opt to keep your old theme while still being able to take advantage of the new Smart Space and Smart Punctuation features. If you're looking to give SwiftKey 3 a try, VIP members can download the beta for free from SwiftKey's website. VIP registration is currently open to everyone, so I would recommend signing up for the VIP program as soon as possible.